A temporary export ban on an ancient Egyptian statue sold by a council has been extended by the government. The 4,000-year-old Sekhemka was sold at auction by Northampton Borough Council for £15.76m to fund an extension to Northampton Museum and Art Gallery. But the government stopped it leaving the country because it was so unique. The deadline for a UK buyer coming forward has now moved to 28 August. It added the ban could also be extended further until next year. The statue represents an ancient Egyptian official surrounded by his wife, son and seven offering bearers. Spencer Compton, the second Marquis of Northampton, acquired it during a trip to Egypt in 1850. It was presented to Northampton Museum by his son some years later. But it was not put on display for a number of years and the borough council chose to put it up for auction last July, selling it to an unknown bidder abroad. However, Culture Minister Ed Vaizey placed the temporary export bar on the statue because it is considered to be the finest example of its kind anywhere in the world. The Department for Culture, Media and Sport has now confirmed the export ban has been extended until later this month. "We have decided to allow a final opportunity for a buyer to put forward a serious expression of interest to raise funds to keep the Sekhemka statue in the UK," a statement said. "This period may be extended until 29th March 2016 if a serious intention to raise funds to purchase the statue is made." The Egyptian ambassador to Britain has previously said the council should have handed the statue back if it did not want it. 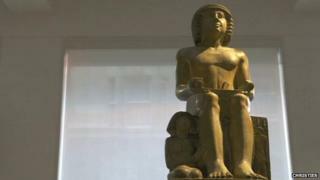 Sekhemka statue export: PM David Cameron urged to "intervene"